The pressure of being world champions and the pressure of being top qualifiers was blown away along with the opposition by the New Zealand team sprinters at the Commonwealth Games today. 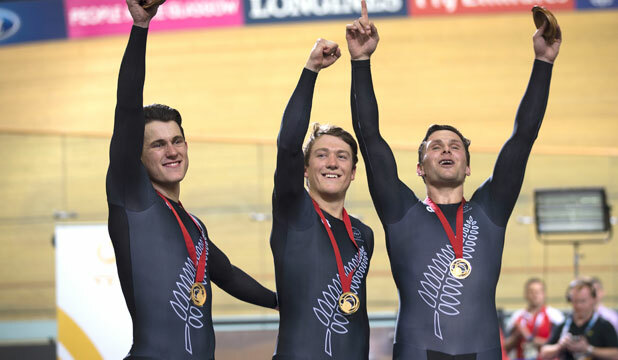 Favourites to claim the gold medal before the competition started, the trio of Ethan Mitchell, Sam Webster and Eddie Dawkins broke the Games record twice on the way to the top of the podium to collect New Zealand's first gold medal in Glasgow. Starter Ethan Mitchell didn't bother trying to hide his emotions on the dais. ''I'm over the moon,'' Mitchell said. The trio broke their own Commonwealth Games record set in qualifying, winning the final in a time of 43.181sec to England's 43.706 from their team of Kian Emadi, Philip Hindes and Olympic gold medallist Jason Kenny. Led out by Mitchell, New Zealand led at every split and Dawkins powered them home as the team raised their fists in triumph. Earlier, the New Zealand team set a Games record on the way to being fastest qualifiers. Their mark of 43.254sec for the 750m event was the best time ever by a New Zealand team at sea level. It wasn't a perfect ride from the New Zealand team, however, with Mitchell drifting off the front of the train during the opening lap. England also broke the previous Games record in their heat with a 43.730sec ride. While Dawkins and Webster would continue in tomorrow's individual sprint - they were second and third fastest qualifiers respectively, Mitchell was looking forward to returning to the athletes village to reflect on being a Commonwealth Games champion. ''It's a big moment, when you've worked so hard for a result like that and to come away with a win, I think it just catches up with you," Mitchell said. "It's all worth it when you are on the top of the podium - to see your mum and dad who have travelled from New Zealand in the crowd with my cousin, it's a really special moment for me,'' he said. Sprint coach Anthony Peden was like a doting dad after his team delivered in the gold medal final against an England team which offered a challenge early before ending up in the weeds. "I'm over the moon; couldn't be happier,'' Peden said. ''They're just a class act at the moment; they've done all the hard work. The New Zealand team looked a class above throughout, qualifying nearly half a second faster than second-placed England in the morning session. Peden was confident the team still had some reserves to be tapped in the final, and during the sprint programme to come. "I thought we might have got a bit more out of them, but that's not a bad thing, we've got two or three more days of racing. It just showed; Great Britain brought their A game to the final, they lifted again... I'm just rapt,'' he said. "I was very confident. There's no certainties in this game but we certainly came prepared. For the last eight weeks we've prepared for this day. ''We've done everything correct and we haven't had many hiccups along the way. ''We've shown in the last week and a half what we're capable of, day in and day out, we're not searching for that little bit of form. In the men's sprint qualifier all three NZ representatives qualified for the quarter rounds, with Dawkins qualifying second with 9.818sec behind Aussie ox Matthew Glaetzer 9.779, with Webster 9.993 (third), Aussie Peter Lewis 9.975 (fourth) and Southland's Matt Archibald qualifying fifth with 10.055. The semis will be ridden tonight at 9.55pm NZ time. Meanwhile Southlander Steph McKenzie did herself proud after getting right in the mix of the women's 500 sprint final - to just miss out on the podium and finishing fourth, just 0.3 seconds behind the bronze medallist.